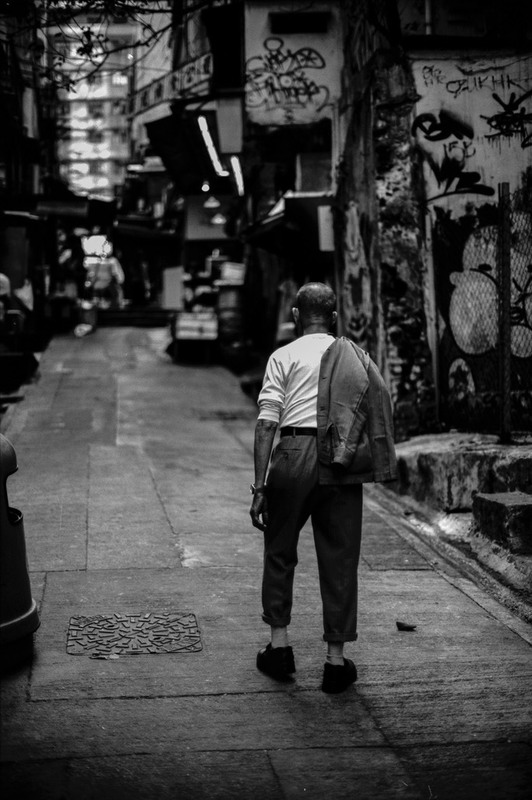 I lived for more than 20 years in Hong Kong. I really look upon it as my home - and somewhere I will probably return after my stint in Japan is over. It is a fabulously vibrant place and always changing. It has an energy to it unlike any other place I have been to - and being able to say that after going to New York is quite an achievement. It still is a fabulous mixture of old British colonialism and modern Chinese (or in this case Cantonese) dynamism. 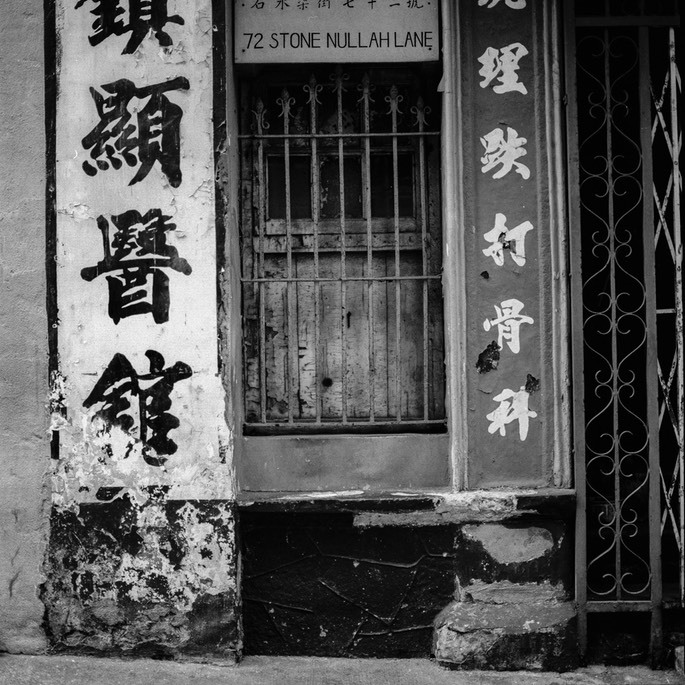 Much of the “old Hong Kong” is systematically being destroyed in the name of progress. Unfortunately I came to photography too late to capture much of the Hong Kong I knew in the late 80’s and 90’s, but I have spent a lot of time photographing many of the things that make it unique and are still around - or were in the past 10 years. 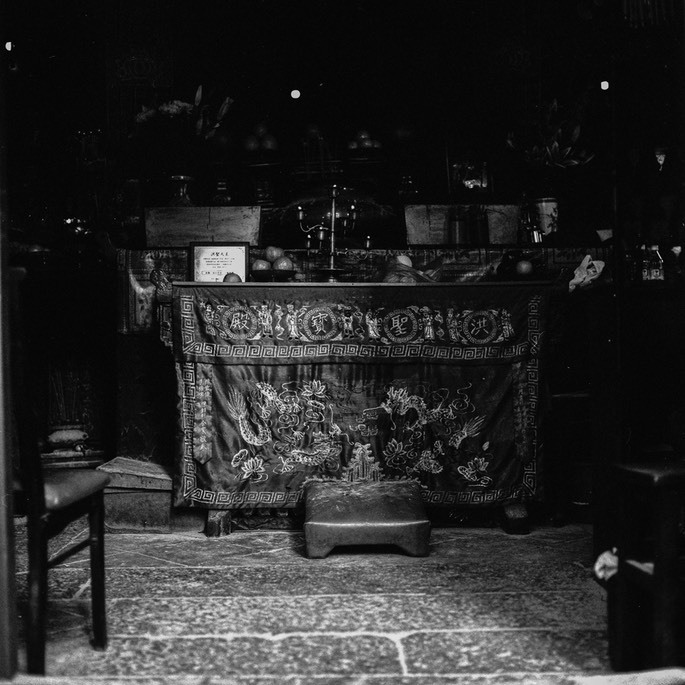 Here is a set of photos taken in black and white - mostly on film…..
One of my favourite photos. 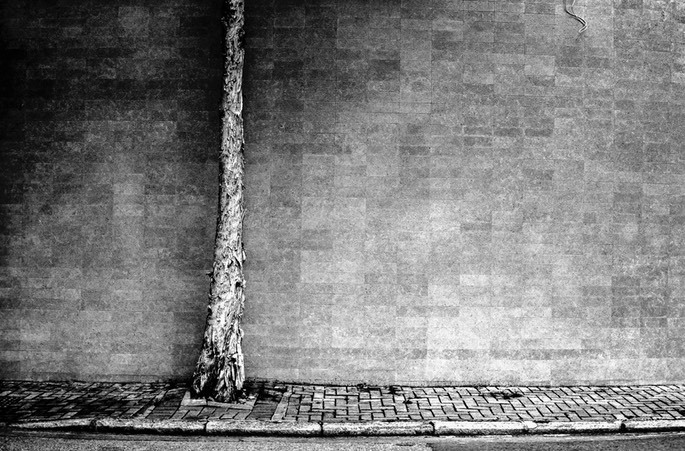 This man walks home up Cochrane Street late in the day. 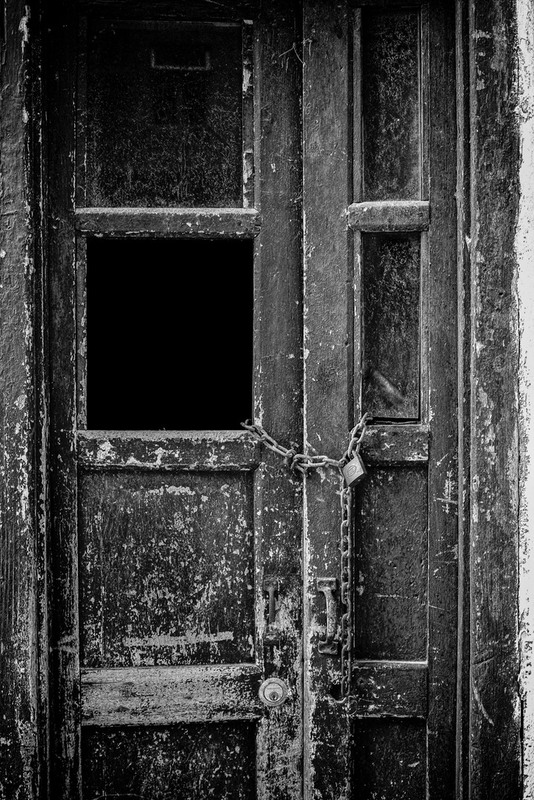 Taken on Fuji ACROS film on a Nikon F3 with Nikkor 50mm F1.2 AiS. Happy Valley is the home to a huge cemetery mostly full of British military graves going back 200 years. Largely deserted. 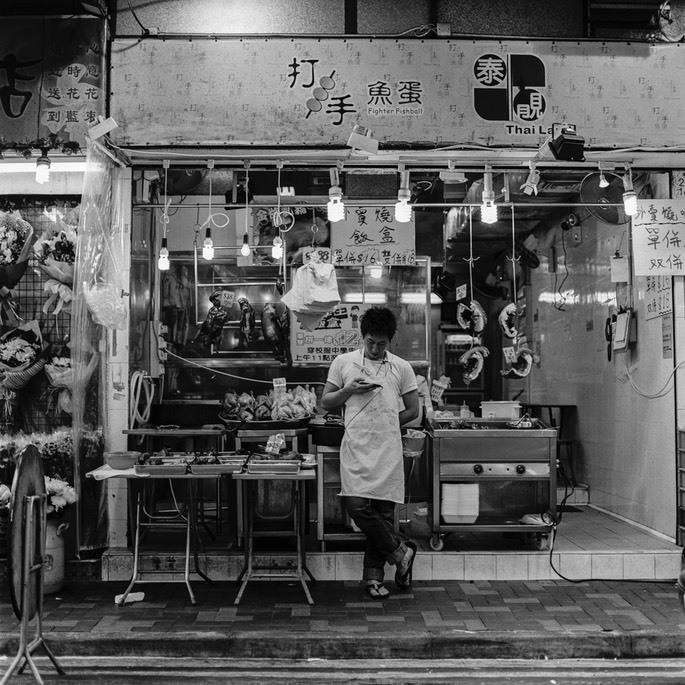 Shot on Fuji ACROS film on a Leica M7 with Canon 50mm F1.2 LTM lens. 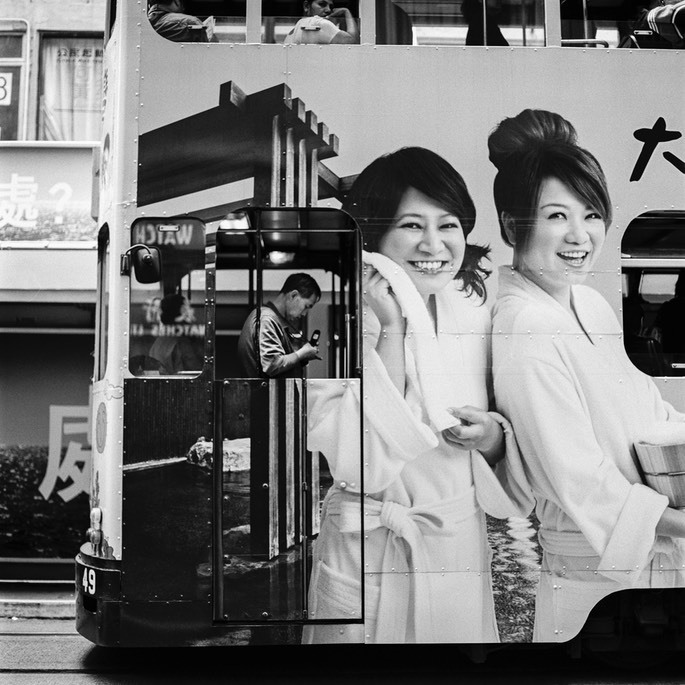 The old trams - known as “ding ding” are pretty much as they were - expect for some garish advertisements. Shot on Kodak TMAX 400 on Hasselblad 500CM. The old Causeway Bay market on Canal Street is gradually going away. A “char siu” or roast Pork shop. Taken on Fuji ACROS 100 on Hasselblad 500CM. Street restaurants called “Dai Pai Dong” used to be everywhere. Almost all are gone from the main business district. All serve hot tea to drink and wash your chopsticks in - usually served from pots like these. Shot on Fuji ACROS film using a 1960’s Pentax Spotmatic with a Pentax 85mm F1,9 lens. Sometimes nature tries really hard to push through the concrete. This tree is on Jardine’s Lookout. 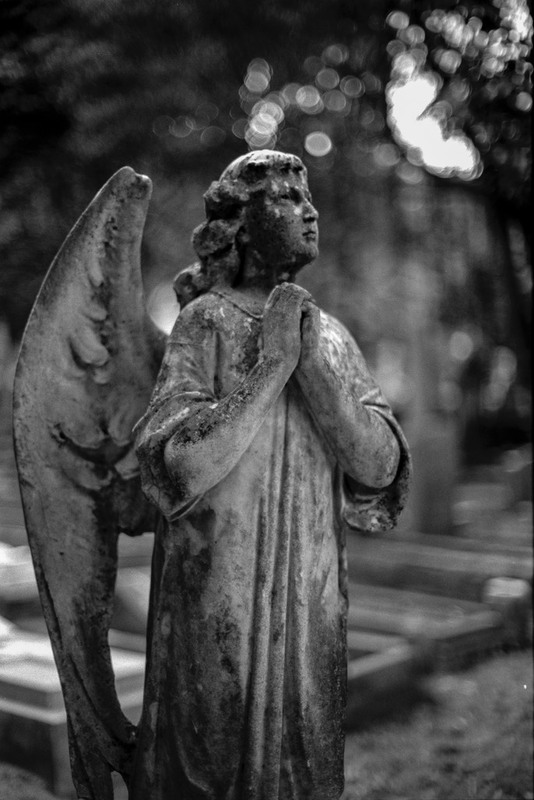 Shot on Fuji ACROS 100 with a Canon EOS3 body and Canon EF 50mm F1.4 lens. 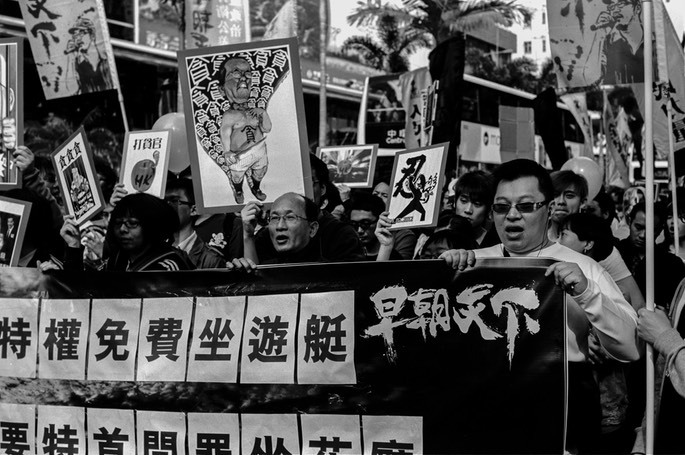 Hong Kong folks have always had the means and laws allowing protest. These days under the watchful gaze of the PRC, they are more and more exercising that right. Here they complain about he previous Chief Executive Donald Tsang. 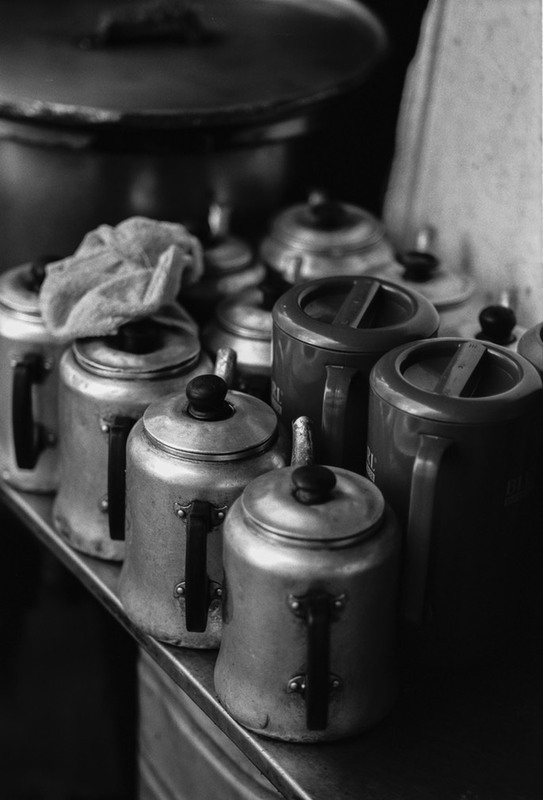 Taken on Fuji ACROS 100 on Leica M6 with Carl Zeiss 50mm F1.4 lens. 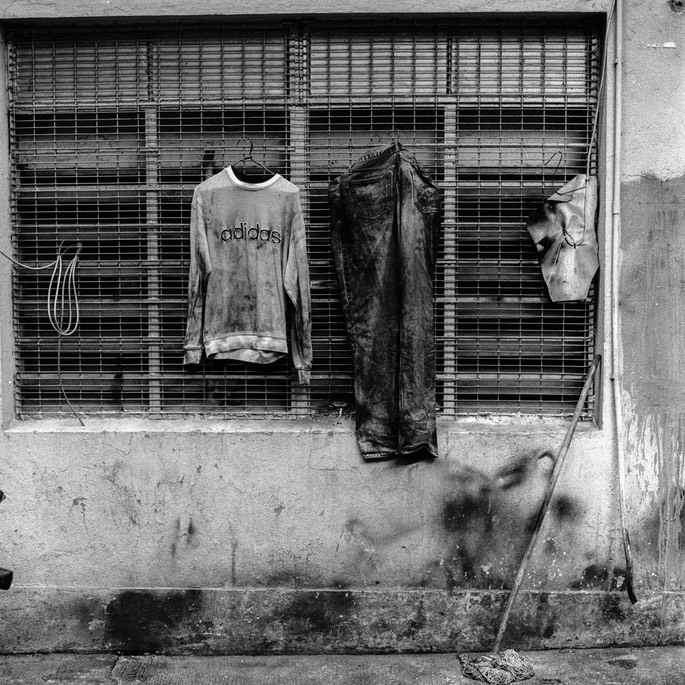 These are clothes of a motorcycle mechanic hanging out in a back street in Wanchai. I cannot believe they have been washed. Taken on Kodak TMAX 400 on a Hasselblad 500CM. 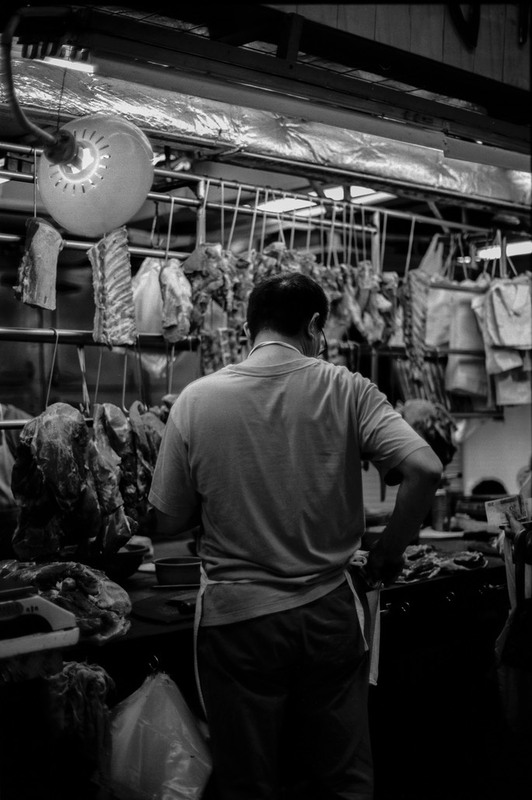 Butchers literally work on the street in Hong Kong. This one operates in Wanchai market, now mostly moved into a sterile Urban Council building. Taken on Kodak TMAX 400 on Nikon F3. Chinese New Year is time for fire crackers- but since they are banned in Hong Kong, it’s tubes that look like fire crackers. This is on an old temple at the end of Stone Nullah Lane in Wanchai. 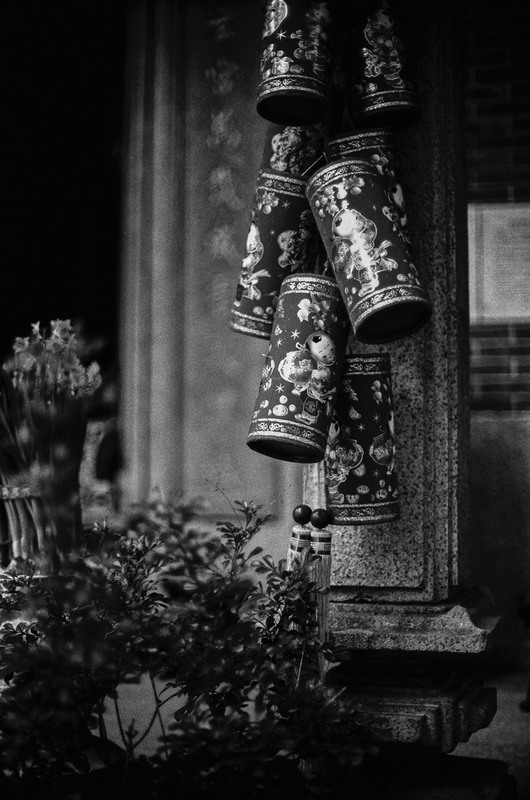 Photo taken on Fuji ACROS film on Nikon F3. 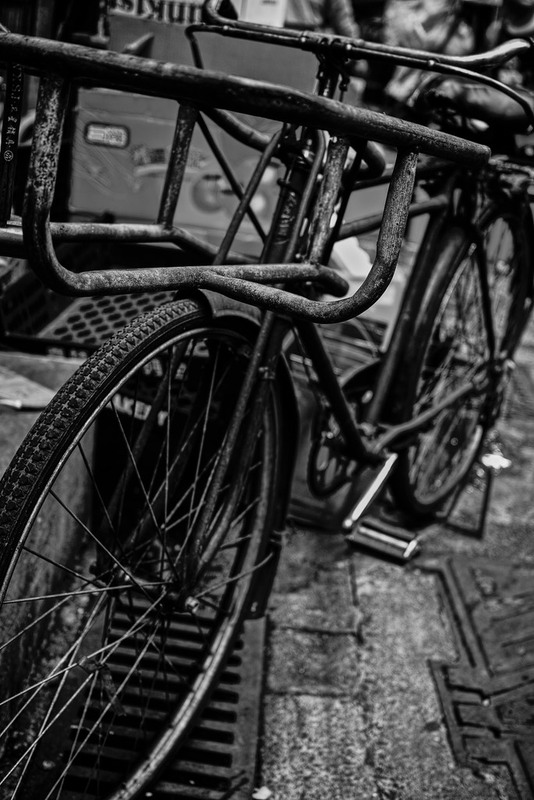 A common sight are bikes like this for delivery of food. Often seen with dead geese, necks dangling, threading their way through busy traffic. Taken on Mamiya 645 Pro TL using Kodak TMAX 400. 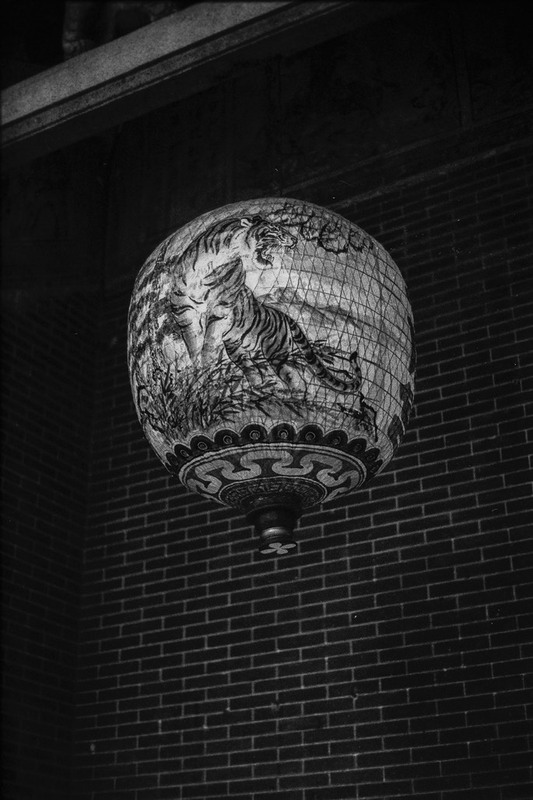 A temple lantern in Tin Hau near Causeway Bay. Photo taken using Mamiya 645 Pro TL and Kodak TMAX 400. A condemned terrace is locked by the “Urban Renewal Project” on the steep slopes hove Central. Another piece of history to be demolished no doubt. Photo using Sigma DP2 digital camera. 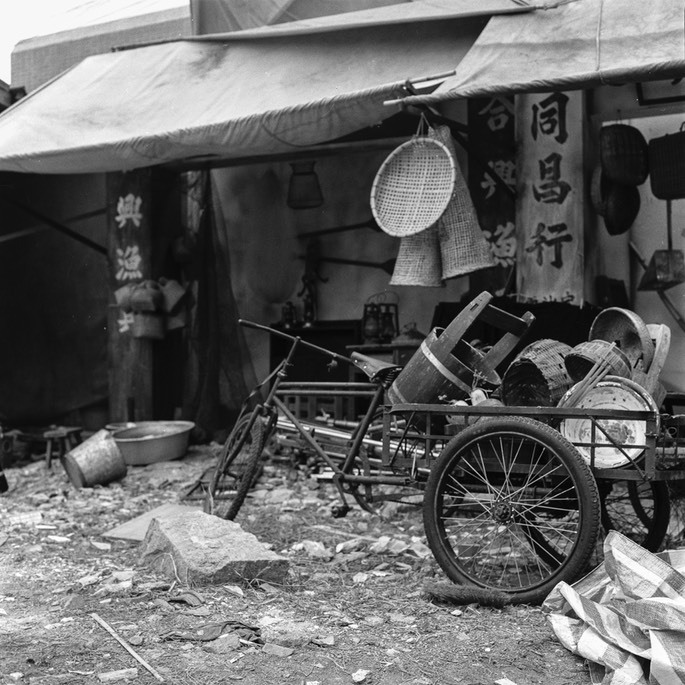 Once in the fishing village of Lei Yue Mun, I came across the remnants of a film set left to fall apart. Photo taken on Fuji ACROS 100 film on Hasselblad 500CM.